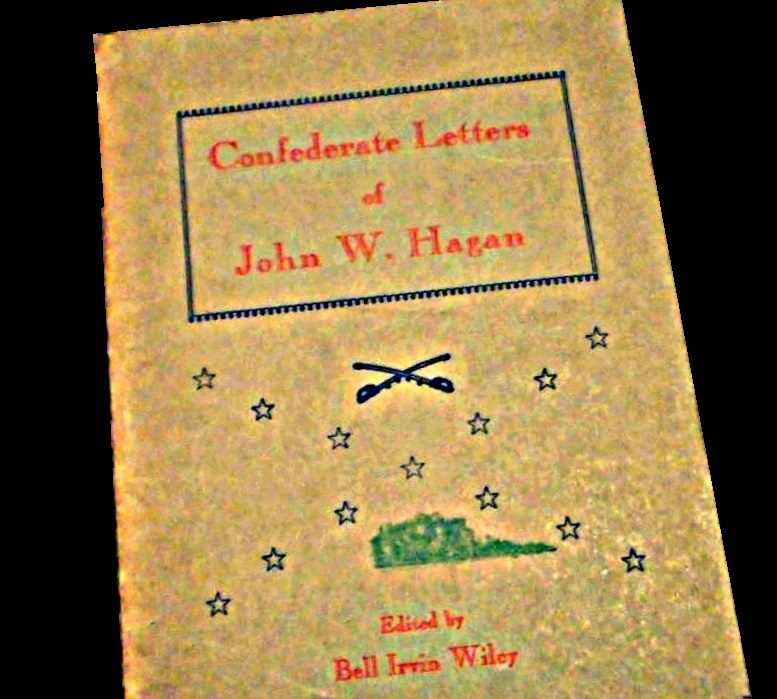 In 1954, the Confederate letters of John W. Hagan were published by Bell Irvin Wiley. Hagan lived in the Cat Creek community near Rays Mill (now Ray City), GA. In the Civil War, Hagan enlisted in the “Berrien Minute Men,” a Confederate army unit organized by Levi J. Knight, original settler at the site of Ray City. Hagan served in the 29th GA infantry in Company D, (later reorganized as Company K, the Berrien Minutemen), and was elected 3rd Sergeant. By 1864, he was serving as 1st Sergeant, and at times was in command of the Company. John W. Hagan wrote regularly from field camps and battle lines to his wife and family back in Berrien County. His letters were typically addressed to Amanda Hagan, his wife, or Rueben Roberts, his father-in-law. He frequently mentions relatives, colleagues in the Berrien Minute Men, and other Wiregrass Georgia residents including James Roberts, Ezekiel Roberts, Stephen Roberts, Sherard Roberts, Kiziah Roberts, Bryant J. Roberts, John J. Roberts, George Roberts, James Roberts, Levi J. Knight, Jonathan D. Knight, William Washington Knight, William Sirmans, John Herndon, Wiley E. Baxter, Barzilla Knight, John M. Griffin, Thomas Griffin, Asa Newsome, William Roberts, Benjamin S. Garrett, J. L. Robert, Elias Thomas, Harriet Newell Wilson, Ellen Groover Clifford, John Moore, Nancy Moore, Isbin B. Giddens, William J. Beatty, James L. O’Neil, William Giddens, Burrell H. Howell, Moses H. Giddens, James Turner, Edward Maloy, U.D. Knight, Henry Harrison Knight, Edwin Griffin, Wiley E. Baxter, William Cameron, Jonas Tomlinson, Thomas Clifford, Jasper Roberts, John C. Clements, Thomas W. Ballard, James W. Mathis, James D. Pounds, James Giddens, Elias Lastinger, James Fender, Aaron Mattox, Moses F. Giddens, and William Anderson. John W. Hagan witnessed and described the death of Major John C. Lamb, who commanded the 29th Georgia Regiment until he was killed during the retreat from Vicksburg, MS in 1863. Hagan also wrote about the execution of “Old Yaller” Elbert J. Chapman, who was shot for desertion even though he had left the 29th Georgia Regiment to serve with another unit. John W. Hagan was captured during the Battle of Atlanta on July 22, 1864 along with John Hearndon, Jonathan D. Knight, James D. Pounds, among others, and was sent to Camp Chase, OH for the remainder of the war . The 43 letters he wrote home between 1861 and 1865 were published by Bell Irvin Wiley, and subsequently appeared in the Georgia Historical Quarterly. The content of these letters may now be viewed online through JSTOR archives of the journal articles. From 1861 to 1863, William Washington Knight served as 2nd Sergeant in the 29th GA infantry in Company K, the Berrien Minutemen, a Confederate army unit organized by his father, Levi J. Knight. William W. Knight was born March 4, 1829 and grew to a man in the neighborhood of Beaverdam Creek, near present day Ray City, Berrien County, GA. In October of 1861, William W. Knight left his farm, 26 acres of cleared land and 464 acres forrested, in the care of his wife, Mary (See The Poetry of Mary Elizabeth Carroll). He left Mary with their one horse, $25 worth of farm implements, six cattle, 35 hogs, about 350 bushels of Indian corn, 120 pounds of rice, 50 bushels of peas and beans, 100 bushels of sweet potatoes, 75 pounds of butter, 80 gallons of molasses, and 50 pounds of honey. Their farm was situated next to that of William’s uncle, John Knight, and also the farm of William A. Jones, who was also serving with the Berrien Minutemen. In a Civil War letter dated June 3, 1863, transcribed below, William W. Knight observes that deserter Elbert J. Chapman had rejoined his unit. Chapman, known to his troop mates as Old Yellow or ‘Old Yaller,’ was shot for desertion about five weeks later, in a tragic episode of military discipline. In the letter, Knight mentions several other soldiers (see notes below), including his brother, Jonathan David Knight. As noted in previous posts, this is one of 37 of Civil War Letters of William W. Knight which have been scanned and placed online by Valdosta State University Archives. He wrote home to his wife, Mary Elizabeth Carroll Knight, and father numerous times while on deployment with his unit. In the letter of June 3, the quality of the original document combined with Knight’s affinity for run on sentences makes for rather difficult reading. For clarity, the transcription below takes some interpretive liberties with punctuation. Knight’s letter of June 3, 1863 can be viewed in the VSU archives. Again I seat myself to write to you few lines th[ough] I wish you could see the seat and place we are camped at. We are in a narrow bottom with a creek running through it, clear limestone water. It is all the running water we have seen in any creek since we have been in this State. We are below Yazoo city three miles, or rather we are sout[h] of it, fifty miles from Vicksburgh. There are more men here than you ever saw in all your live, the number I will not give, not knowing but this might fall in the Federals hands. We came here yesterday. We lay up day before two miles from here. We left our camp at Deasonville, Saturday near twelve o’clock and marched till night. Sunday was the hardest days march we ever taken, not the farthest, we have marched farther in the day, but the country very broken, the weather very hot and not water enough to barely sustain life. Many men gave out and could go no further. Some fainted in the road and had to be taken up and carried off but none of our brigade died from the march so far as I can ascertain. This country is the barest of water of any I ever saw. We are gradually closing up around Vicksburgh. The Abrahamites are around it, our men inside under Gen. Pemberton, our outside army under Gen. Johns[t]on or he commands the whole army. We are under Gen. Walker. He is my General now and in command this squad here. They are from different states. There is some sickness among the men but none of them dangerous. I think in our company there the following men sick but they can walk about and tend to their business: John S Adams, William Cameron, Henry A. Lastinger, Mathew R. Lindsey, Edmond Mathis, Aaron Mattox, John A. Parrish, Corpl. John R. Patterson, Alfred B. Findley, Jacob J. Truitt. They are only too weak to hold out to march. They have fever or diarrhea. Jonathan had the fever two days ago but he is better, he did not have much fever yesterday, he got too hot Sunday of the march. Lt Parrish is well again. All the rest of the Company are well. Manning Fender got a letter from James Fender last week he was getting better. We left him at Columbus, Ga.
Elbert J. Chapman, or as the boys called, Old Yellow, is with us again. William D. Warren of the Sharpshooters from Thomas County found him at Canton. Warren did belong to our regiment before he was put in the Sharpshooters battalion. Chapman is heartier than I ever saw him, he was in the 20th Mississippi Regiment of mounted infantry. He had been there five months and two day[s]. The regiment has been in several battles since he has been in it. He went by the name of Manning Coleman. He says he does not know any thing of Benjamin Garrett, that he has not seen him since last December. They got parted at Brookhaven in this State. We have no tents in our regiment, we take the world and weather as we find it. We have four fry pans and one oven for our company. The rest of the companies are no better off than our[s]. Where we are stopped we get enough to eat, but when we are marching we do not have any chance to cook enough to eat, and water to cook with is often not to be had. We marched seven miles Sunday. After sunset we stopped to camp where it had been represented we could get water but it was not there to get, and we had to come seven miles further before we could get it, and then there was not enough and what there was was very bad. I will describe the kind of water we have been using until we come to this place. That is, if your imagination will help draw the picture. It is in holes in the creeks, the soil thick yellow mud void of sand, the water yellow muddy stuff with a green scum on it – but seldom over a foot deep – some times half covers holes. And no more near enough to be got at, and that the chance for several thousand men, and a great many of them like hogs. If they are not minded out, they will be in it, washing there hands, face, feet or old, nasty clothes. Its astonishing how many men there in this world that are only animals in human form. Ask one and he will tell you it is wrong, but he saw somebody else do so and he had as well do so as any body else. That is always the answer you get. They have a kind of elastic consciences that expand to fit any case. This is a very rich farming country. They make fine corn with the least work of any country I have ever been in. They break up their land, plant their corn, side the corn, turn the dirt from it, hoe it out, let it stand about two weeks, side it again turning the dirt to the corn, let stand about the same time, and plough out the middles, and they are done that crop. They make from thirty to fifty bushels to the acre. Their lands are nearly all bottom lands. It averages fifty bushels to the acre. Mary, I got two letters Saturday from you dated the 9th & 17th of last month. I was very glad to hear that you and the children had been well since I left Savannah. I say had been, for the[y] had been written so long they were almost out of date, but I recon mine are quite as old before they get to you if they ever get there. Well, Mary, I recon you need not be uneasy for fear I will suffer for money because of what I sent you. I have quite as much as I will need, I hope. If I had not have left Savannah I should have sent you as much more. I have sent you this year one hundred and ten dollars in money and a little over thirty dollars worth of things. I have about sixty dollars with me now. I recon it will last me till we draw again. I had much rather see you and the children than any amount of money we will ever have at one time. I am in hope I will keep well and able to do all the duty that may be required of me. I think all the men in our company would get well in a week if they could have that long to rest. There is no chance for them to write when we are on a march. We have but one ambulance for the regiment. It will not carry more than eight men. I will write when ever I have a chance. William W. Knight, Enlisted as a private Company D, 29th Georgia Regiment, October 1, 1861 in Berrien County, GA. Made 2nd Sergeant in December, 1861. Was sent for Camp equipage in December 1862. September 5, 1863 receipts show he accepted at camp in the field a delivery of two pairs of shoes. Receiving equipage in the field, October 31, 1863, “the men being in a destitute condition.” Requisition records show he was at Dalton, GA on December 6, 1863 where he received additional equipment for the unit. Died of chronic diarrhea at Milltown, GA. December 27,1863. A son of Levi J. Knight, and husband of Mary Elizabeth Carroll. John S. Adams was from Duval County, FL. He enlisted as a private in Company K, 29th Georgia Regiment on April 3, 1862 in Savannah, GA. By the late spring of 1863 service records show he was a patient at the Confederate hospital at Point Clear, AL. He apparently recovered to return to his unit, but in the summer of 1864 he was again sick, this time appearing on the register of patients at Ocmulgee Hospital, Macon, GA and suffering with chronic diarrhea. He was furloughed on May 16, 1864. Alfred B. Finley, private, Company D, 29th Georgia Infantry. Born in Georgia on January 15, 1840. While in the Confederate service he contracted measles and St. Anthony’s Fire (erysipelas), a streptococcus infection which resulted in loss of his left eye. Captured near Nashville, TN on December 16, 1864, during the Battle of Nashville, TN. Released at Camp Chase, OH, June 12, 1865. Died at Nicholls, GA on October 18,1921. Benjamin S. Garrett, private, Enlisted October 1, 1861 Company K, 29th Georgia Infantry at Berrien County, GA. August, 1862 at Convalescent Camp. Service Records include the notation “Deserted.” Reported absent without leave for December 1862. Some say Garrett was later killed in Florida, but regimental records show he joined the 17th Georgia Infantry Regiment, was sent to Virginia, caught typhoid pneumonia and died November 9, 1862 at Chimborazo Hospital No. 5, Richmond, VA.
Jonathan D. Knight, Was the brother of William Washington Knight. Jonathan D. Knight was Captain, Company D, 29th Georgia Regiment. He was captured near Decatur, GA on July 22,1864 during the Battle of Atlanta and held as a prisoner of war until released at Fort Delaware, DE on June 17,1865. Later elected a senator in the Georgia state government, and signed the Georgia Constitution of 1877. Henry Andrew Lastinger, private, joined the Berrien Minute Men (later renamed Company K, 29th Georgia Infantry) officially inducted on August 1,1861. He was a son of Louisa English and William Lastinger. His sister, Elizabeth Lastinger, was present at the Grand Military Rally for the Berrien Minute Men held in May, 1861 at Milltown (now Lakeland), GA. Four of his brothers also served with the Berrien Minute Men. A fifth brother served with the 5th Georgia Reserves. On September 19,1863 Henry A. Lastinger was shot in the right foot at the Battle of Chickamauga, GA, leaving him permanently disabled. Received extra pay from March 18 to August 2, 1864. Pension records show he was at home on wounded furlough close of war. Born in Georgia in 1832. Died December 24,1908. His brother, Lacy Elias Lastinger, wrote about the execution of Elbert J. Chapman after the war. Matthew R. Lindsey, private, Company K, 29th Georgia Infantry. According to Widow’s Pension records he enlisted May 10, 1862, was wounded in right shoulder at the Battle of Kennesaw Mountain, June 27, 1864; was furloughed for 60 days in 1864, and was unable to return the unit. Edmond W. Mathis, enlisted in Company K, 29th Georgia Infantry as a private on October 4, 1861, later Corporal. He was captured near Nashville, TN on December 16, 1864 during the Battle of Nashville, TN. Died February 11, 1865 of pneumonia at Camp Chase prison, Columbus, OH. Buried in Grave #1175, Camp Chase Confederate Cemetery. John R. Patterson, born about 1830, enlisted in Company K, 29th Georgia Infantry as a private October 1, 1861. Appointed Sergeant. Wounded near Atlanta, GA, August 1864 during the Atlanta Campaign. Evacuated to a temporary Confederate field hospital at Forsyth, GA, known in confederate service records as “Ford Hospital”, established by Andrew Jackson Foard, Field Medical Director for the Confederate Army of Tennessee. Died in the hospital at Forsyth, Monroe County, GA August 14, 1864. Buried at Forsyth City Cemetery. John A. Parrish, Private, Enlisted in Company D, Georgia 29th Infantry Regiment on November 1, 1861. Absent, sick, December 31, 1861. In Convalescent Camp August 31, 1862. On June 14, 1864 he was wounded at Pine Mountain, GA; that was the same day Confederate General Leonidas Polk was killed atop Pine Mountain by a lucky cannonshot from Union forces. After June 14, John A. Parrish never returned to his unit. He was born February 18, 1844 a son of Josiah and Mary M. Parrish. Died October 28, 1885; buried Antioch Cemetery, Adel, GA.
Jacob Truett, Private. Born in South Carolina February 9,1834. Enlisted December 5, 1861in Lowndes County, GA. Service Records show in October 1862 he was “absent on expired sick furlough,” and still absent sick in November and December, 1862. In the Spring of 1864 he was issued new clothing and detailed with Captain O. D. Horr. He was again issued new clothing on September 30, 1864. Wounded in left shoulder at Murfreesboro, TN on December 7, 1864, the date of the Battle of Murphreesboro. Admitted to Way Hospital at Meridian, MS, on account of wounds, January 19, 1865. Pension records show he surrendered at Greensboro, NC April 26,1865, the date and location of General Joseph E. Johnston’s surrender to General William T. Sherman. Manning Fender, private, Company K, 29th Georgia Infantry. At Convalescent Camp August, 1862. Killed in battle at Chickamauga, GA, September 19, 1863. Aaron Mattox, enlisted in Company G, 29th Georgia Infantry. On August 22, 1864 he was captured at Atlanta, GA and sent to Camp Chase, OH. From there, he was transferred to Point Lookout, MD on March 22, 1865. He died while imprisoned there in 1865 . William Cameron. Private. Shot in the left arm during battle on June 15, 1864 with the ball lodging in the left elbow. Admitted to Ocmulgee Hospital, Macon, GA on August 23,1864 where apparently the lead ball was removed from the wound. Furloughed home to Clinch County, August 29, 1864. Surrendered and Paroled at Thomasville, GA on May 26, 1865.